Americans spent an estimated $40.1 billion on prescription medications in 2016 to treat these conditions, and expenditures are forecast to grow to more than $44.1 billion by 2019. Three conditions which drove the highest prescription drug expenditures in 2016 were chronic pain ($14.3 billion), PTST ($10.6 billion), and sleep disorders ($6.13 billion). Prescription drug use, most commonly associated with medical cannabis, falls an average of 11% in states with legalized medical cannabis. 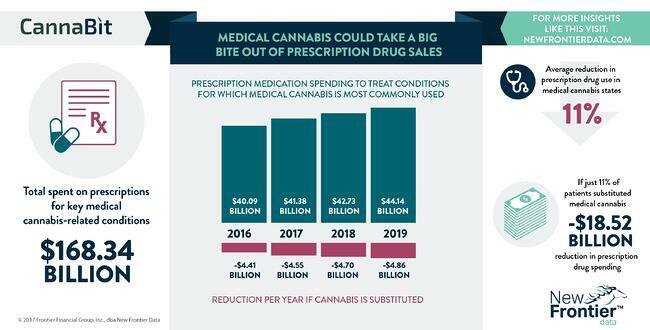 If medical cannabis use were legalized nationally in 2016, an 11% decline in prescription drug use would have equated to an estimated $4.4 billion in reduced prescription drug spending, and an estimated $4.9 billion in 2019. Between 2016 and 2020, the 11% reduction in prescription drug spending would be a combined $18.5 billion. The impact that cannabis legalization will have on the pharmaceutical industry underscores why pharmaceutical companies have been so strongly opposed to the expansion of legal cannabis. For example, Insys, maker of the opioid Fentanyl Subsys, funded the 2016 anti-cannabis legalization campaign in Arizona. Insys’ financial support of the opposition helped defeat the initiative on election day.